The biggest challenge of my racing career had finally arrived, the 400m Le Man’s sprint to my bike to start the 2016 Barn Burner, a 100 mile race just outside of Flagstaff on the forest roads circling the Kendrick Peak Wilderness area. There was a lot of pressure on me for this race, Danielle had her eyes set on the podium. This would be our first race together as a Co-Ed relay duo and I didn’t want to let her down. The gun sounded and the herd was off running. Danielle was towards the end holding my bike and I hopped on and got to pedaling. Happy to have the run behind me (and hitting my max heart rate) it was all engines go for that first 25 mile lap. The course is fast. A lot of people like to talk down on the Barn Burner course for being a roadie event, and I agree to certain extent, but you need to be comfortable going fast over some pot-holed and rocky terrain. The course is like holding onto a jackhammer, unrelenting and it steadily beats you down. Another challenge for the first lap was the amount of dust getting kicked up and illuminated by the rising sun low on the horizon making visibility an issue. As the lap went on I was shocked to have a few friends and soloists hammering out a fast first lap. A few of them would sustain that incredible pace (simply incredible), while others blew up. This race draws a big solo crowd with hopes of snagging a qualifying spot for Leadville and to get a spot you have to be ready to suffer. There are no qualifying spots for relay teams, but that didn’t matter to us much. An hour and a half later I rolled through the exchange area and Danielle was off! While Danielle was hammering out her first lap I recovered a bit, had a quick bite to eat and checked the standings. We were in 2nd place and only a few minutes behind team Booty and the Beast. As I lined up for Danielle to come through I saw our competition and hoped Danielle would come through first. Unfortunately the other team went out for their third lap just a few minutes before Danielle came through. They were slowly chipping away and increasing their lead. Once Danielle came through I was off and pedaling again trying to wake the legs up and work that lactic acid back out. Once my legs woke up this lap was more enjoyable because the dust wasn’t providing a visual challenge and the traffic had thinned out so line choices were easier. As I pushed through the lap I pulled a few solos along for a bit and I’m always happy to help them out as I’ve been in their shoes before and it is nice to get some help. There are two semi-technical downhill sections on the course and I managed to get held up in some slower traffic on both of these. The first downhill section is pretty rocky, but not too loose so a tire puncture is more of a threat than an over the bars scenario. The second downhill isn’t rocky, but line choice is key to avoid some large ruts from erosion. Because this section is pretty smooth it’s easy to gain some good speed and those ruts approach very quickly. The final stretch of the course is a slight uphill on a well maintained fire road. This is the true roadie part of the race and it took everything in me to keep my legs spinning and the effort up. I knew there was only a few more miles left before I was done so I gritted my teeth and pushed on trying to close the gap between us and first. As I rolled through and handed off to Danielle and I wished her luck and found a nice shady spot to sit and recover. Once I was able to breathe normally again I checked the results and my lap time was just a bit slower while the team ahead had a very similar lap time so another few minutes of ground lost. It was up to Danielle to close the gap. In the end we were unable to close the gap and we ended the day in second,. I think Danielle had her sights set on that top step, but we were still very happy with the results and we earned the large buckle for finishing in under 8 hours. Between her recent trip to India the week before and some unfortunate drama/stress outside of racing, a second place finish was a solid victory for us. Additionally Danielle was happy that she wasn’t the weak link on the team. We were very evenly matched with the first place team, each of them were just slightly faster and gained a few minutes every lap on both of us. I was happy with the close competition as it made things exciting. I was also really proud of Danielle’s effort. This was only her second mountain bike race, she did great and remained steady for both of her laps. 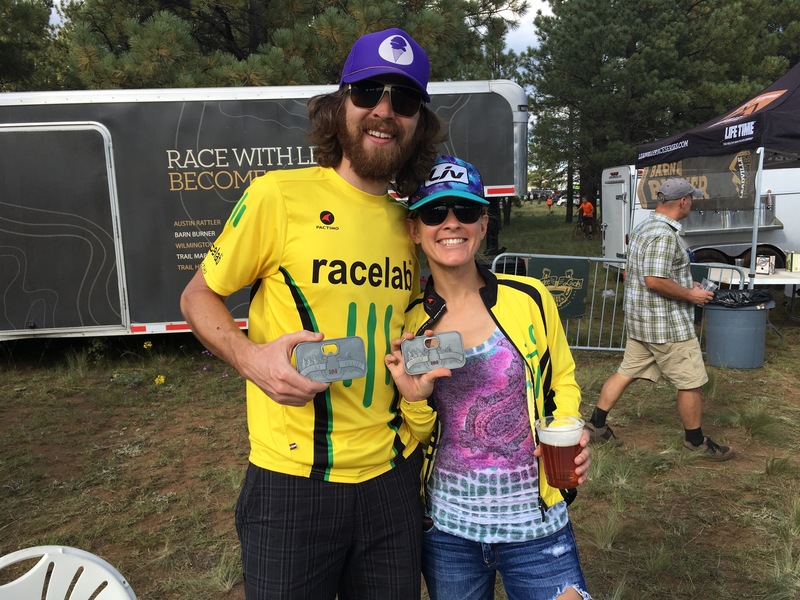 Post-race refreshments were enjoyed, a trip to the podium was made, and another night spent camping up in the pines of Flagstaff was complete…a good day of racing for sure. As always our successes are not ours alone, this wouldn’t be possible without the help and support from our incredible sponsors: Racelab, Thomson Bike, Pactimo, Rudy Project, and Flat Tire Bike Shop. At the beginning of this year I set a goal, to win the co-ed duo race at Barn Burner. Then I spent the rest of the year hearing my coach, Dave, tell me why this wasn’t a good goal and that I’d better set a time goal as well. I ignored his criticism of my goal setting and got busy training under his tutelage. I used Crusher in the Tushar to build up a strong base and foundation. After that it was a quick recovery and then my focus shifted to honing my mountain bike skills, or rather, trying to find some mountain bike skills! I got an awesome Salsa El Mar from Kaolin and The Flat Tire Bike Shop, started spending a lot more time out on the trails with the Cactus Shadows Mountain Bike team and Dave helped me work on descending and navigating rocky, technical terrain. I managed to get in three pre rides on the Barn Burner course so I could figure out which skills would be the most critical. As we got closer and I was sufficiently recovered Dave really cranked up the heat with some long high intensity workouts, these were completed with some of our teammates and friends that are all experienced and successful mountain bikers, nothing like riding with faster people to push yourself! I was focused and feeling stronger and then I found out I would be traveling to India for work, returning five short days before the race. I knew it would be hard to recover from such a long trip and adjust between time zones (India is 12.5 hours ahead of Phoenix) so quickly, but I wanted to make the most of my trip to India and spend some time exploring there rather than rush home so I could rest up for a local cycling race. During the weeks leading up to my trip my mental energy shifted towards my trip and less towards Barn Burner, I stopped giving Dave detailed feedback on my training and crammed the workouts in without a lot of motivation or intention. After an amazing trip I returned home and tried to reignite my determination to win the race. As we headed up to Flagstaff on Friday evening I had never felt less in race mode in the final twenty-four hours before a race. Still tired and distracted by non-related events, my mood was bleak. Finally, as we got closer to the race venue I started feeling that familiar nervousness and restlessness in my legs. Alright! Saturday morning we got up had breakfast and got our stuff ready and chatted with friends and our coach Dave and his wife Windy. It was really cold so I was happy that Ryan was going to complete our first lap. After wishing him luck and handing him his bike as he sprinted ahead of the competition I headed back to the car, cranked the heat, listened to some music and meditated in preparation for my laps. Ryan’s first lap was over quickly, he came through just over 1:30 hours, five minutes behind the first place team. Gunning for the first place team, I started out hard as soon as Ryan handed me the baton [handing off a baton really is not necessary but I had forgotten my tire levers and CO2 chuck at home so we had to share…did I mention I wasn’t mentally prepared for this race?]. It was a bit strange to be hammering off of the starting line all by myself without any competitors alongside me, pushing me to ride harder. I was glad I had done a few relay workouts with Dave so I could stay focused and push despite the fact that I was by myself. Eventually, when I got into the first slightly rocky section I started getting passed by lots of skilled and fast riders. I tried not to slow down and use the brakes despite the fact that I felt like I was undergoing a seismic beating. I knew going faster would make the jolts and bumps less painful, but my mind didn’t have control of my body as I tensed up, gripped the handlebars and the brakes, watching all the faster riders fly by. At some point a guy enthusiastically told me I was doing an awesome job, I was thankful for the encouragement but internally laughed thinking that this guy probably thought I was a teenager. During races I find that men often think I am super young and new to cycling, not sure if I should take it as a compliment or an insult, but it provides some entertainment. Eventually the first bumpy section was behind me and I got to start climbing up to the half way point, to the first real technical section, known as the rocky downhill. This is one section of the course that I dread because it is challenging for me and I take it very slowly. Luckily I made it through relatively quickly and because I was still surrounded by talented riders they all passed easily and with control. After getting through that I let out a sigh of relief, I only had one more technical section ahead of me. The stretch between these two technical sections is uphill and difficult. I was really missing my Salsa Cutthroat and extra climbing gears through this section, but I tried to stay focused and keep turning the pedals. Like the first technical descent I made it through the second one easily without any stopping, unclipping or tears – that alone was a big accomplishment because until the race I had never made it down that hill [although during my solo pre-ride I somehow skipped that part of the course due to a lack of navigation skills]! After the descent I laid down the hammer, passing many people that had flew passed me on the downhill and got into the transition area to hand Ryan the baton. My lap time was 2:04. I had wanted to go sub two hours, but I knew that would be tough, the first place team continued to chip away at their lead, with their female rider throwing down a 2:00 lap. Happy and very tired I wandered over to my car to recover and prepare for my second lap. “Oh, I saw a girl that looked like her towards the end, so I tried as hard as I could to pass her,” I sheepishly confessed. Even though I didn’t accomplish my goal and even though I embarrassingly thought I was in first when I wasn’t I am satisfied with the outcome of the race. I’m even glad that I thought I caught first because it gave me something to focus on and something to finally resuscitate my determination. My last lap was slower than the first, but I’m sure it would have been even slower if I didn’t think I was fighting for the win! But that’s what racing is all about, giving it everything you have and your best effort for that day. I can’t control who shows up on race day, I can only control my own preparation and performance. I have a lot to work on as I continue on this journey of becoming a mountain biker, but taking second in my second race is a great accomplishment and I’m happy I was able to do it with Ryan as my teammate! As Ryan mentioned I am very thankful for all the support we receive from our coaches and sponsors!